Hello, hello everyone! Welcome to week 4 of Summer School! Right now, you're in science class. Rae and I are going to teach you some rad tricks all about - Drop Shadows! Let's jump right in shall we? Here we go! 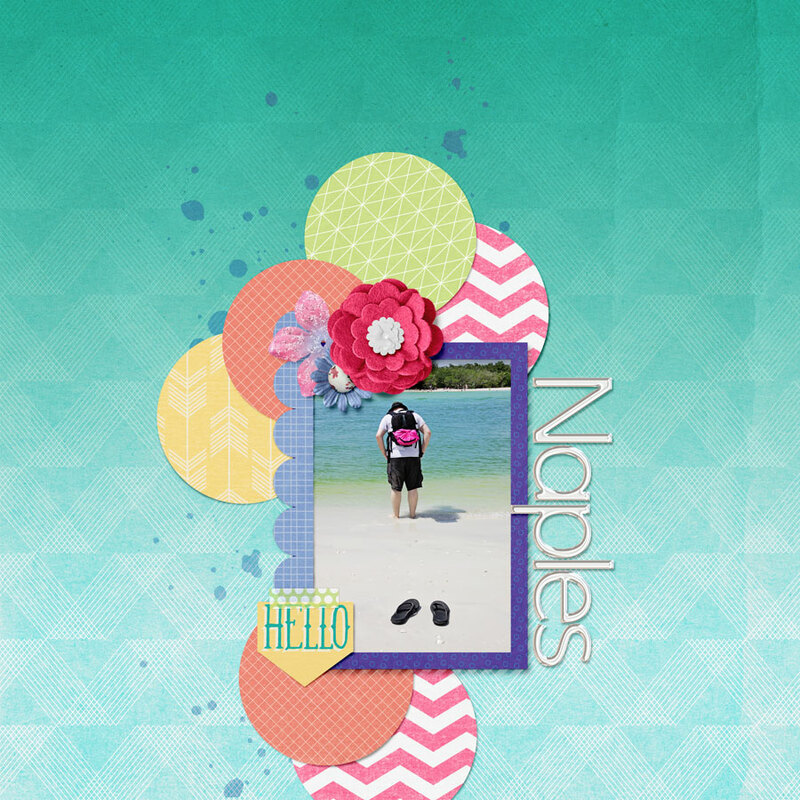 Drop shadows are one of those techniques as old a digital scrapbooking itself. It's key to making our pages look dimensional and realistic. Shadowing is what gives our creations life. I'm sure the majority of us have heard our share of tutorials on the many techniques one can use to alter our shadows. I believe, however, that we can always learn more. 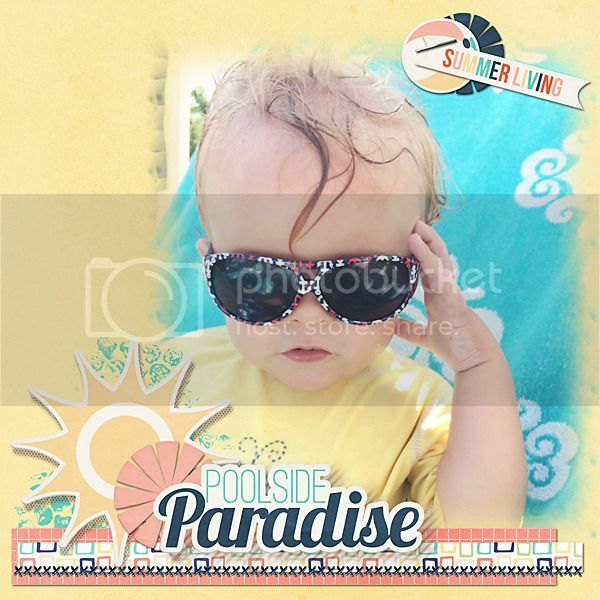 Always evolve in our skill and knowledge of digital scrapbooking even with a staple technique such as adding drop shadows. I want to revisit such an awesome and vital skill and show you how even the most seasoned digital scrapbookers can take their shadowing to the next level! This tip is for all and I really hope you enjoy! With all that said, a little while back I was playing in Photoshop making a promotional graphic and accidentally added pattern to my shadow! I immediately undid the "mistake" and then a lightbulb clicked ...I realized that it was actually pretty cool! I recreated the altered shadow and I am SO glad I made this particular 'oops'. Patterned drop shadows are easy to make, fresh and make your pages pop! Let me show you how it's done! The main thing you're going to do to get ready for your pattern to be added to your shadow is to separate your shadow from the object. In doing such you have your rasterized shadow on a separate layer that can then be manipulated, and in our case, with a pattern overlay. If you are a Photoshop Elements user please view the video below! I demonstrate how to separate your shadow in elements as it is a different process than in Photoshop CS. Quick Tip | Separating Drop Shadows in PSE from Karla Dudley on Vimeo. Cool yes?! Now you're ready for the next and final part! Now I'm going to show you how to add pattern to your shadows. View this next video to see how I do it! Quick Tip | Adding Pattern to Drop Shadows from Karla Dudley on Vimeo. And that's all there is to it!!! As you can see...adding pattern to shadows is super easy and so freakin' awesome!!!! I hope you learned something today and will then take what you learned with you along your digi scrap journey! Ok guys, you have homework to do! Your science homework is to create a layout using the technique of Adding Pattern to your Shadow. You can do this on as many elements you like. So stoked to see what you all create! Last edited by mommyish; 07-06-2015, 08:11 AM. Oh My Goodness! This sounds interesting! I will be playing with this challenge. Karla, not only are you genius at tutorials, you make them fun too! Thanks so much, fabulous tutorial and awesome freebies! OMG I love this! Karla, you are a genius. GAME CHANGER! gotta give this a shot! thanks, KD, you da bomb!! you perfected it here Kiana! 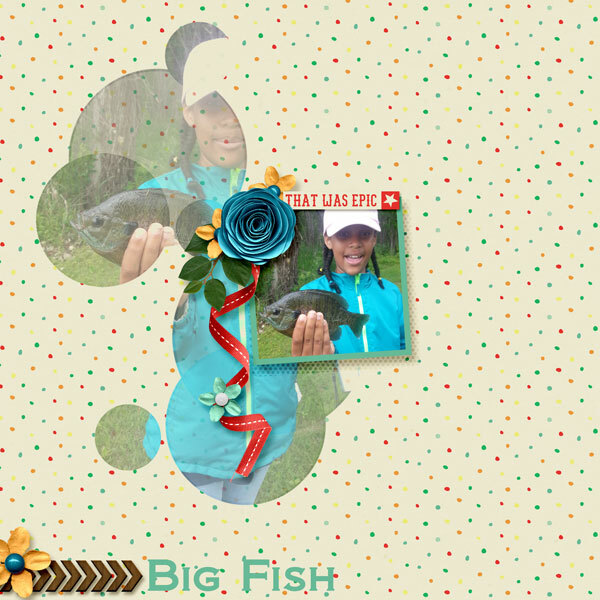 love the layout and amazing that she caught the fish!! I'm really digging the polka dot shadow on your sun. Oh! what a lovely lovely big pic! totally love the way you scrapped and the patterned shadow has come out so well! After skipping class for 2 weeks, I couldn't resist jumping in. Patterned shadows are not something that I can get happy with on my pages but I love seeing on everyone else's. Oh! you should totally be happy with this! love the treatment of the shadow plus the way the blue resonates with the colour of the water in the pic! lovely work! This is soooooo fun! Leave it to Karla! You gals are just rockin' the shadows! Love all these layouts!